There’s no point in beating around the bush – having an energy efficient building is becoming vital when faced with today’s economic reality. More than ever before, due to higher demands for energy and rising costs, it’s a fact of life that businesses need to find cost-cutting solutions to keep their heads above water. Whether it’s for manufacturing or commercial companies, or high-rise offices or apartments, the needs are virtually the same – find ways to evaluate how energy is being used, and then start making improvements to the status quo. To do that, it’s best to break down areas of concern into specific sections, then tackle each one in an orderly manner, with energy efficient improvements and savings the two-pronged goal. It’s highly recommended that getting a energy audit done, with a professional analyzing a situation based on the focal points mentioned, is the smart way to go; perhaps the only way to go, when it comes right down to it. Then areas where a building is losing energy can be pinpointed right away and upgrades suggested that will lead to ongoing and long-term cost savings. The benefits speak for themselves. Energy efficient lights have the capability to use less energy to produce the same amount of light output, with the same quality and performance, as traditional lighting sources. Recenttechnological developments have advanced the energy efficiency abilities of light bulbs by 30-60 per cent, which means lower utility bills and environmental effects. Using less energy reduces emissions of carbon dioxide, air-borne mercury, and other harmful pollutants from power plants that burn fewer fossil fuels to meet the lower energy demand. Lamps with longer life will require fewer replacements, reducing the demand for raw materials and lowering recycling costs. Many large buildings still use traditional mechanical devices to control system flow, and that is not energy efficient or cost-effective. Huge amounts of energy can be saved in in the heating, ventilation and air conditioning (HVAC) through the use of variable speed drives. A mere 20% drop in speed of centrifugal pumps and fans can save as much as 50% in energy. Many heating, cooling and ventilation distribution systems operate at a constant flow rate, even though peak demand may only be required for a few hours. The conventional response to meeting the changing demand for heating and cooling within a building is to restrict flow to individual rooms, while maintaining peak flow in the central HVAC system. However, through the use of this approach, considerable energy is used and equipment lifetime is shortened. A much better approach is to use a variable speed drive on HVAC pumps and fans to vary air or water flow to meet more precisely changing load demands. The term harmonics commonly refers to a distortion of the normally smooth utility power. Problems such as voltage sags and surges, transients and harmonics are estimated to cost Canadian businesses about $1.2-billion annually in lost production according to studies by the Canadian Electrical Association. 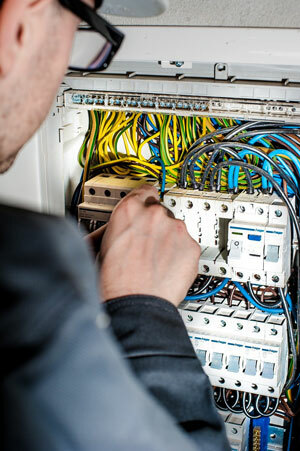 The financial impact of these power disturbances varies, however it’s recommended that any business needs to effectively eliminate harmonics in its facility’s electrical system to keep things running efficiently. Besides the conservation and money-saving factors, there are many other advantages to implementing the aforementioned energy efficient measures. If a building is being sold, it will definitely command a higher sale price if it boasts an updated automation system, with control functionality, efficient/attractive lighting systems, and mechanical systems that operate seamlessly and don’t require constant repairs or replacement. At the same time, a property can also retain existing clients much more successfully if it boasts a lower operational cost. And it can attract new tenants much more easily if it can be marketed as energy efficient. Not only that, but energy efficient upgrades can do away with most of the day-to- day hassle associated with maintenance personnel always changing light bulbs or fixing air conditioners. Moving towards more efficient equipment reduces these needs and ends up as a win-win for both tenant and building owner. Bishop Site Service can help with all your energy efficient upgrades. For a no-obligation consultation, give us a call.